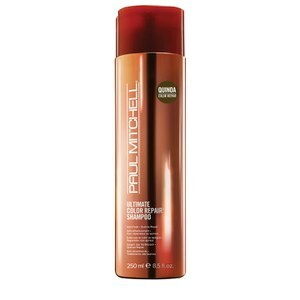 Achieve smoother, softer hair with the Ultimate Color Repair™ Shampoo from Paul Mitchell. The sulphate-free shampoo removes excess oil, dirt and impurities from colour-treated hair, whilst sugar cane and lemon peel extracts enhance shine for healthy-looking locks. Its Quinoa Color Repair complex delivers protein to repair hair strands and lock in moisture so you can experience vibrant, manageable locks. The luxurious shampoo preserves coloured hair by providing UV protection against harmful damage and environmental stresses to ensure colour is maintained after each wash. E.N. Paraben and sulphate free, colour safe and suitable for vegans. Lather into damp hair, then rinse.